Note: “A Whole New World” is a series of articles that I do before each block rotates out of standard. In these articles, I take a look at all of the cards that will no longer be standard tournament legal, and speculate whether or not they will be returning to future sets or have no chance of being reprinted any time soon. I will also talk about which cards to hold on to, and which cards NOT rotating will be affected by these changes. As with my “Bang for your Buck” articles, I can’t be held responsible for any mistakes I make. I will plead my case for each card and if you agree, then you can act on it and make the decision. Really, take your pick. 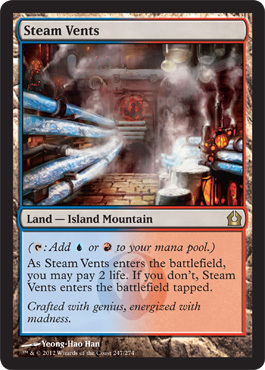 Steam Vents, Breeding Pool, Godless Shrine, etc. – they’ll all be sorely missed in the multicolor Khans of Tarkir set (especially with fetch lands making a return). We had some good times with these lands, I’ll give you that. They’ve been amazing and will continue to be amazing even after they rotate out in a few weeks. Shocklands were $20-$30 each before they were reprinted in the RTR block. Thankfully we now have an ample supply that should fuel EDH, Modern, and Legacy decks for years to come. In the near future, you might still be able to get the Shocklands you need for a decent price. This is largely because modern season is over and a few people will be looking to unload excess cards they don’t want to sit on. The longer you wait, the worse it’s going to be. These cards are only only going to go up again as the years go on. I don’t expect the shocks to be reprinted again for a loooong time, so you can be sure that each land will gain a few dollars in value AT LEAST over the next year or two. Watch out for possible fakes from China that are still out in the market, but otherwise get your play sets now. Mutavault was like the Tarmogoyf of standard this last year. Stick it into any mono colored or two colored deck to get an advantage. Mono black devotion, UW/x control decks, Mono blue devotion, and just about any aggro used it to great results. It was going for $35-40 at one point, but has recently dropped to about $20. Most places in Japan are still buying it for $18 or more, so I expect it to hold a lot of value after rotation. The Morningtide version was at $30 or more for a long time before the reprint, so I think the M14 version and it will both recover over the long run. If you can get some for around $15-$20 they might not be a bad investment. Merfolk plays it in Modern, and it also sees play in a lot of casual tribal decks such as Slivers. 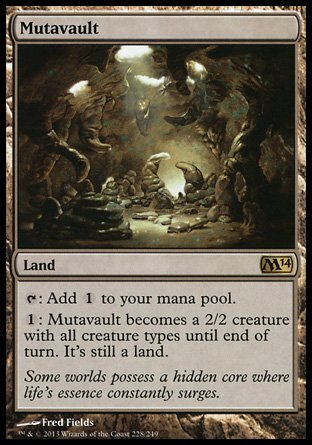 Mutavault isn’t high on my list of trades, but if you have some already it’s probably a good idea to hold onto them. 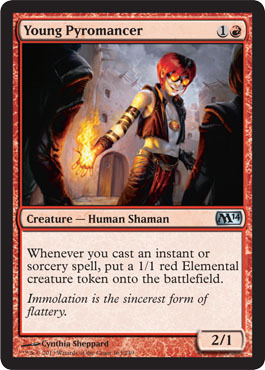 Young Pyromancer was somewhat of a lost child when it originally hit standard. Nobody really knew where it belonged and it was stuck in fringe decks for a while. As the months went on and Red burn decks came together, Young Pyromancer finally found a home. It was as high as $3 at one point (which is amazing for a core set uncommon), but has recently stabilized at $1.75 or so. We could realistically see this in any set in the future, especially one with really good instants and sorceries. I don’t think it will become a regular, but it will definitely make a comeback one of these days. However, I could recommend picking them up now so close to rotation. They see play in some Legacy and Modern decks and as they become rarer their price could go northwards of $3 again. If you can get them at around $1, I say get a play set and sit on them. Worst case scenario you have a playset when they come back in standard again and it saved you some cash. 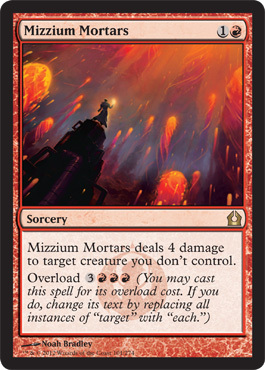 In my humble opinion, Mizzium Mortars has always been an awesome removal card. It was released at a time when Restoration Angel was patrolling the skies and it dealt with her nicely. During Theros standard it saw a lot of play in Gruul ramp decks as well as Red devotion decks. At its peak you could get it for around $6-7, but now it’s less than $1. I don’t see it getting reprinted for a very long time if at all. The Overload keyword will see to that. If it ever does come back, it will be in one of those Duel Decks. I don’t really see it coming back in any eternal formats, but there is a possibility it could see play in EDH because it hits all creatures. Might not be a bad card in a deck with Gisela, Blade of Goldnight as your commander. If that’s true, then it might be a good idea to pick up a foil cheap (they are currently around $3.50). I’m sure the prices will dip a little bit more right before/after rotation, so keep you eye out for a cheap foil. Not a strong recommendation, but also not a heavy investment. If you’ve ever Skullcracked somebody when they used a Sphinx’s Revelation or -8 an Ajani, Mentor of Heroes, then you know how much fun this can be to play. It is, and will continue to be, a mainboard card for burn decks in all formats. I expect it to be a key card in Modern and Legacy burn decks, and the further we get away from RTR’s rotation, the more expensive it will become. Burn is one of the easier decks to get into if you’re playing in either of those formats, so I’d guess that it will be in high demand. Pick them up at $1 if you still can, because they could be triple that in another year or so and go even higher without a reprint. Speaking of reprints, we could see it back in a future life gain heavy format (especially if Thragtusk ever returns to standard), but I don’t think we’ll see it soon. 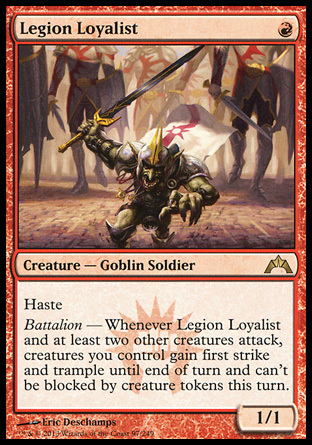 Legion Loyalist is finally getting some play in the Rabble Red decks alongside Goblin Rabblemaster, and his price has soared to over $5. This card was no more than $2 for most of its life in standard, so I’m happy for the little guy. However, I don’t think that value you can last. He’ll drop after rotation, but still hold some value. Goblin players in Legacy or Modern might use him, but if you can get good money for him now do it. I’d sell them off at $5 if I could, and then pick them up after rotation at about $2-3. The foil is also only about $7 right now, so that might be worth considering too. Lots of players like to foil out their decks in older formats, so why not? The Battalion keyword also means he isn’t likely to be reprinted in any decks for a very long time, which will add to his scarcity. He should also hold a lot of casual demand because of his Goblin typing as well. 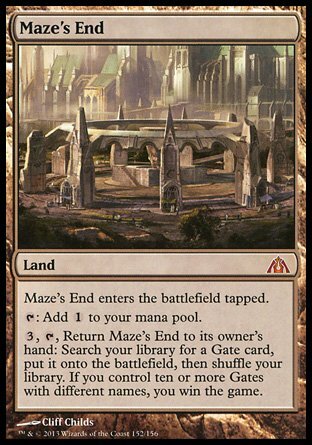 Maze’s End might not seem like it’s a good candidate for an investment, but I beg to differ. I think Maze’s End will hold a lot of casual value after rotation which will keep it’s price afloat. Regular versions are going for $1.50 at the moment, but the real deal is for foils at $3.75. If you could get a playset at $3 each I think that would be a very good investment. This is a one-off card that will probably NEVER be reprinted in Magic again. Wizards would have to reprint all of the Gates again which has a very low chance of happening. People will continue to play Maze’s End with their friends and with Dragon’s Maze being opened less than both of the other sets in RTR block, I’m sure it will be a little harder to find. I would also consider picking up foil Guild Gates if you can find them for under $1. This is a long term investment though, so don’t consider to make any money back on them for at least a few years. 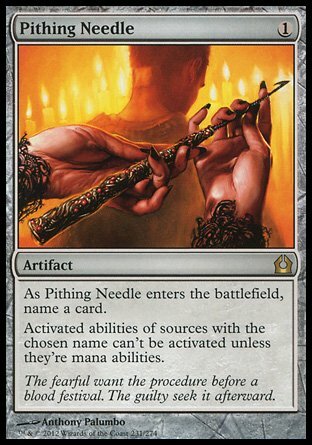 Pithing Needle has sat quietly in the recesses of standard, always waiting for the right moment to hit unsuspecting opponents from the sideboard. It’s been great against planeswalkers, and up until rotation I will have it in my sideboards to deal with Jund Planeswalkers. Without it in standard, dealing with planeswalkers such as Xenagos, the Reveler and Garruk, Apex Predator will be a lot harder to deal with. This was the card’s 4th printing, so I don’t expect it’s value to go up after rotation. I also don’t think it would be a good investment if you don’t have them already. If you have a play set, hold onto them until the card is reprinted in the future (which could be any time). That will serve you better than getting rid of it now for $1 or less. 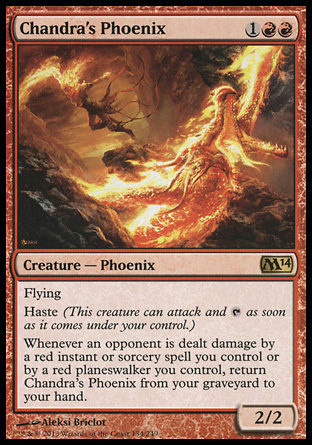 Chandra’s Phoenix was a great reoccurring threat in burn decks in standard. It’s really too bad that he is rotating because I think he would be fun to play alongside the Sarkhan Vol (whenever a red planeswalker deals damage, right?). Not having it will slightly weaken burn decks. In burn, every point of damage counts and with the loss of the Phoenix, Skullcrack, and Shock, I think the deck is going to have problems killing its opponents quickly. As for play in other formats, I think Chandra’s Phoenix isn’t going to see much play at all after rotation. It will most likely become a bulk rare for less than $1. But fear not, it should eventually see play in a future set. As long as Chandra is a planeswalker, there’s a good chance it will see standard play again. If you didn’t sell yours a few months ago, you might as well wait until it returns in the future. 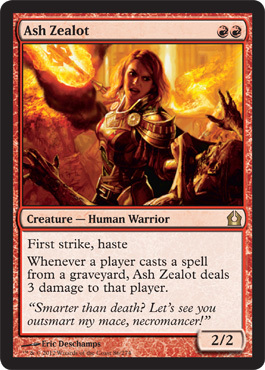 The last card in my article today is Ash Zealot. It was a great card to have back in the time of Snapcaster Mage during Innistrad block standard. 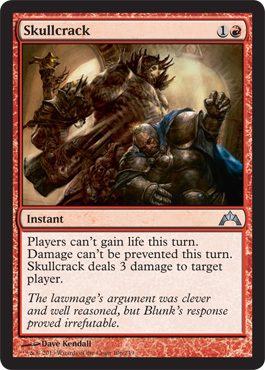 It saw a lot of play in mono red decks for most of that block, but when Theros block began, it found a new home in red devotion decks. The flashback clause was no longer relevant, but the double red, first strike, and haste was. I think it’s worth mentioning this card because without this, Frostburn Weird, and Burning-Tree Emissary, red devotion decks are pretty much dead. We could possibly see a reprint in the future when playing cards from the graveyard becomes big again, but I don’t see that happening for a while. She should hover between $1-2 after rotation and not change much. I’m working on a modern red devotion deck (which you might have seen before) that uses her, but she might also see some play in red aggro decks because of how good she is against UWR control and Storm decks. To summarize today’s article, basically we’re looking at a severely weakened Burn deck post rotation, red devotion will be nigh unplayable, and red/x decks like Gruul ramp and Jund planeswalkers lose a good sweeper in Mizzium Mortars. The loss of Mutavault also takes away the advantage of control and mono colored decks like Mono black and Mono blue and force them to play more threats to end games without going to time. I think we could be in for the return of Red/x aggro once more on the backs of cards like Goblin Rabblemaster. RW heroic and Jeskai aggro are definite possibilities in the new standard next month. The spoiler should be out in the next week or so, so we’ll see! Thanks for reading and again, if you have any comments or want to suggest some cards that you think I might have missed, please do so. I’ll be working on the final article covering multicolor and hybrid cards when I get the chance, so look for it in the next few days. I’ll definitely have it out before rotation though! See you next time!